First, a flashback to 1991 and that photo we told you about where Mike Healey was flipping off Jeff Stanton at the Japanese Grand Prix. Racer X reader Joe Malich found it, and here it is! Fast-forward to late February 1993. 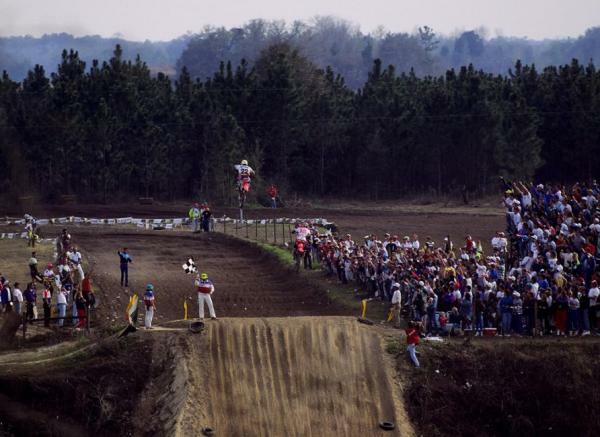 By the time that season's AMA Motocross Nationals kicked off at Gainesville, Florida’s Gatorback Cycle Park in March, the sport had been rocked by Jeremy McGrath’s early surge through his rookie AMA 250 Supercross season. McGrath, already the best 125 SXer the sport had seen since the class' birth in 1985, had shown some promise in some 250cc mains late in the '92 season, but no one could have predicted he would show up at the first round of the AMA Motocross Championship having won four of the seven AMA Supercross mains by that point. Young MC (still a relevant term back then) was slated to race the 125 Nationals by Honda, but he had never been as strong outdoors as indoors. Lo and behold, though, he was back to shocking people in Gainesville, leading the final moto and heading to the opening-round 125 overall win. But someone forgot to give the memo to veteran privateer Erik Kehoe. In a memorable moment, Kehoe was chasing McGrath on the last lap when pinned his Honda of Troy CR125 up the final jump—the Gator Pit—and never shut off. He launched an unimaginable distance, way over McGrath’s head, to steal the moto win in dramatic fashion. McGrath still won the overall—his first ever in AMA Motocross—but the moto win marked the last great moment in Kehoe’s racing career. Hey, wait a minute. What’s a Team Honda rider like McGrath doing in the 125 class, anyway? Didn’t they ship their 125 operation over to the Peak/Pro Circuit squad? Indeed, Mitch Payton’s outfit delivered three 125 AMA Supercross Championships in two years, but for 1993, Honda dismissed Payton’s effort and rejoined the tiddler class with McGrath and ex-Yamaha privateer Doug Henry. Payton scraped together a Kawasaki effort, claimed the 125 West SX title with Jimmy Gaddis, and won the overall at the Unadilla National with Englishman James Dobb (on perhaps the dustiest day in Unadilla history). But at that time, Payton’s team was not a contender for outdoor championships, and Team Honda wanted that 125 National Championship back. Meanwhile in the 250 class, Kawasaki workhorse Mike Kiedrowski was ready to take the final step in his slow, steady ascension to the top of American motocross. 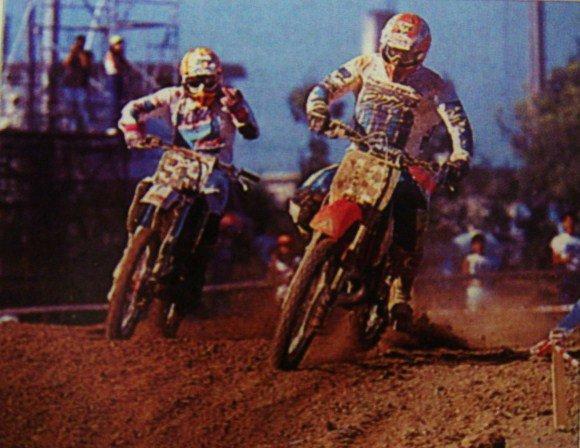 With Jean-Michel Bayle gone for road racing, Jeff Stanton and Damon Bradshaw were expected to battle for the '93 title, but Kiedrowski stepped up his game and won Gainesville over both. The 1992 500cc AMA Motocross Champ (and ’89 and ’91 125cc Champion) kept rolling, winning Southwick, Budds Creek, Unadilla, Red Bud, and Kenworthys en route to a washout in the series. Bradshaw won at his adopted home track at High Point, but otherwise, no one could top the MX Kied. As for Bradshaw, the bitter loss of the previous year’s AMA Supercross title seemed to wreck havoc on his mind and heart, and although he won a handful of races, he just wasn't the same. After an obvious slowdown on the racetrack that summer, on September 27, 1993, he shocked the motocross world by announcing that he was retiring from the sport and walking away from what was up to that point the most lucrative motocross contract in the sport—$450,000 a year from Yamaha. Bradshaw was burned out, and while he would eventually come back a year and a half later, his best days were behind him. 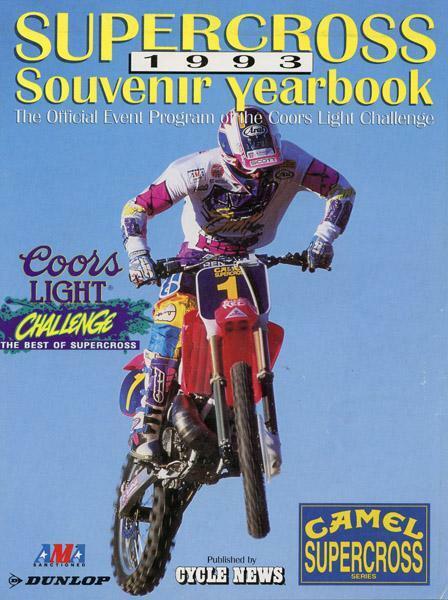 Damon Bradshaw graced the cover of the fourth and final issue of Inside Motocross. 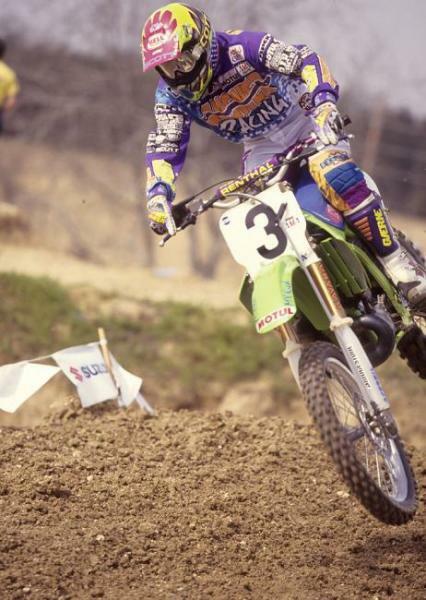 Team Kawasaki had a good run in 1993, as its KX250 was becoming the toughest bike in the field. Team Honda had won the previous four 250 AMA Motocross Championships, but by the end of the season Kiedrowski’s only competition was coming from his Kawasaki teammate Mike LaRocco. LaRocco missed Gainesville with a broken wrist from supercross, but by the final round of the 250 series at Glen Helen, he was back up to speed, and he won. That Glen Helen race, by the way, enjoys an interesting footnote in history: it was the first and only “one-moto” national. The series was experimenting with different rule and schedule changes, and they decided to run a single-moto race at Glen Helen—and on a Saturday, no less—as a test run for improved TV coverage. On an incredibly hot day in San Bernardino, LaRocco topped the field. He then carried that momentum into the 500 series, which at this point had become a shell of its former self at just four rounds. 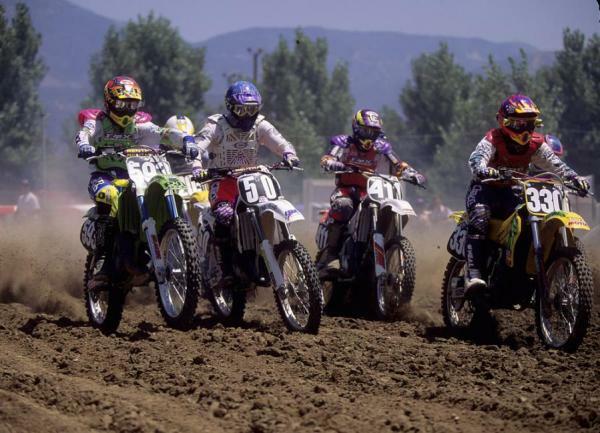 The AMA announced the series would go away after the season, and the 250 class would race the full twelve rounds in 1994. Yamaha and Suzuki had long abandoned building 500 motocross bikes, leaving just Kawasaki and Honda to battle for the title each year (except for 1991, when Yamaha stuck Bradshaw on the air-cooled YZ490, which at this point was being called the WR500 and marketed as a desert/off-road bike). Stanton was determined to get that elusive big-bike championship, and he rode well in ‘93, but LaRocco outlasted him to win the championship by nine points. It was the first National Championship for LaRocco’s career, and helped soothe the pain of losing the 1992 125 National Championship in heartbreaking fashion. The highlight of Stanton's '93 season may have been this program cover. Back in the 125 class, McGrath’s MX skills didn’t quite hold up. His new Team Honda teammate Henry won round two at his native Southwick—not a huge surprise. Then the defending class champ, Jeff Emig, caught fire on his Yamaha and won round three at High Point. 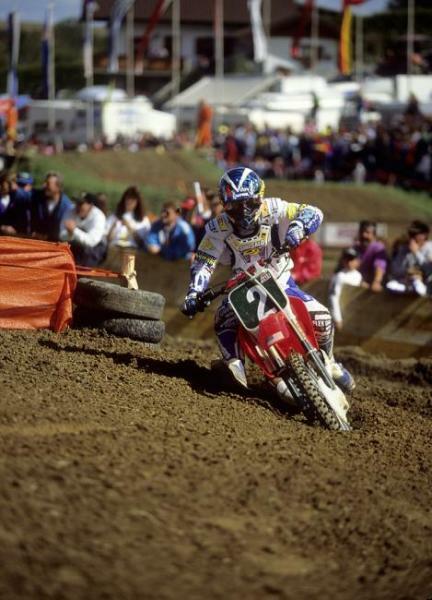 But Henry proved stubborn, and he and Emig battled for the championship. It was a great fight, and Henry ultimately emerged with the championship. Henry’s rags-to-riches tale was reminiscent of Guy Cooper’s 1990 triumph. Where many 125 National Champions had developed from the top of the amateur ranks, Henry and Cooper made their name following the nationals as unknown privateers without an amateur record to speak of. What they lacked in polish they made up for by simply twisting it harder and hanging it out further. This quality, of course, made them huge fan favorites. Doug Henry blasts up past the old mechanics' area at Unadilla. Today, obviously, Honda moving back into the class and pushing Payton’s highly successful program to Kawasaki looks like a bad move. At the time, though, Henry delivered both the 125 East SX title and the 125 AMA National Championship, so it looked like they had made the right choice. Henry was all grit, but if you were looking for the next super-talent from the amateur ranks, he showed up at the Steel City finale. Team Kawasaki’s Robbie Reynard won the Steel City race at just 16 years old, becoming the youngest AMA National Motocross race winner ever. 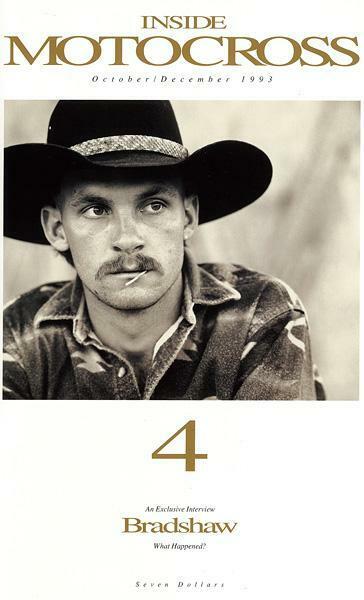 His record still stands today. After the 1992 Motocross des Nations debacle where the big names like Stanton, Bradshaw, and Kiedrowski bowed out of the race, the AMA put pressure on the riders by letting fans vote for the team. They elected '92 hero Emig for the 125 and Kiedrowski for the 500. 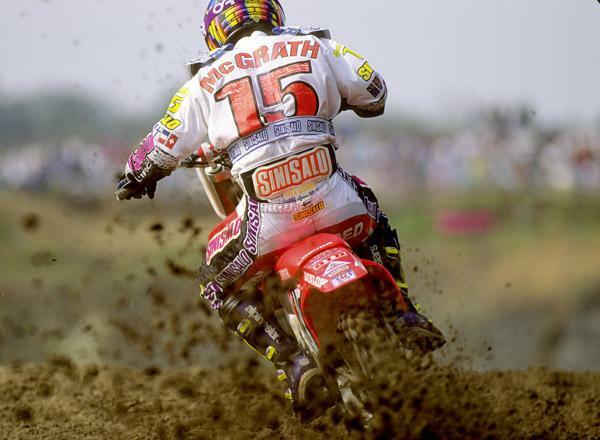 But 250 Supercross Champion McGrath got the 250 vote, and he had never raced outdoors on a 250. MC was admittedly nervous for the race in Austria, but he rode to solid top-seven finishes in his motos. Emig and Kiedrowski held up to their end, and Team USA had won the event for a whopping thirteenth straight year. But it was getting tougher and tougher each time. As mentioned yesterday, the sport was entering a strange place. At the end of the 1993 season, Bradshaw would announce his retirement at age 21. The pressure to win had sapped Damon’s drive, and although he stood to make a lot of money through his massive Yamaha factory contract, he was so burnt out on racing that he decided to walk away from it all. 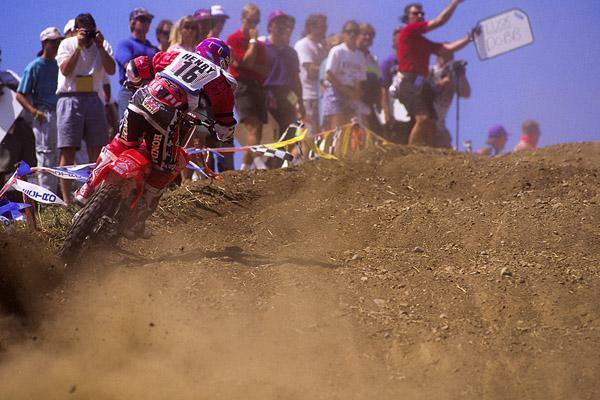 Rick Johnson retired in 1991, and Jeff Ward and Jean-Michel Bayle retired at the end of the 1992 season. The sport was in need of new heroes.